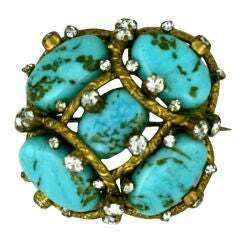 Brutalist Turquoise, Lapis and Diamond Brooch in heavy 18k gold setting. Oval and pear shaped stones are mounted above the dimensional setting with diamond accents. Interesting, high quality setting. Stones to appear to be sitting on raised bed of golden coral. Loop for use as pendant as well on back. 2.25" x 1.75" x .75" high. 1970's USA. 18k gold, 25 dwt. 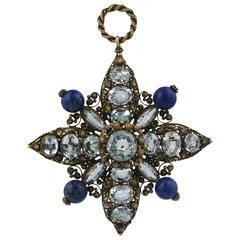 Important volume, this Lapis Lazuli Taurus is mounted on Diamond and Gold Brooch Pendant. Made in Italy. Circa 1970. 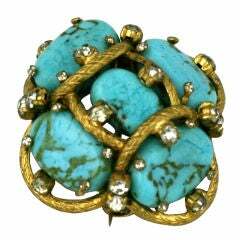 Turquoise and Diamond Brooch set in 18K yellow gold. Center old mine cut diamond is just under .50cts. Beautiful engraving in the scalloped design of the gold.